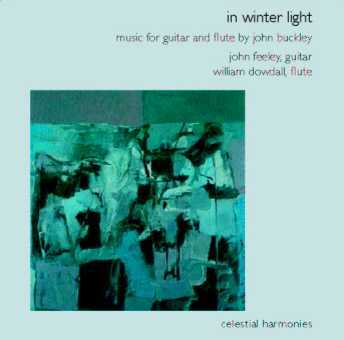 In Winter Light is a collaboration of talents from Eire (The Republic of Ireland)—contemporary composer John Buckley, guitarist John Feeley and flautist William Dowdall. The recording comprises a selection of works for flute, alto flute and guitar dating from 1973 to 2004. The title is taken from an image in the epic poem Omeros by Derek Walcott, 1992 Nobel Prize of Literature recipient, and reflects the character of the music, much of which was written in the winter months over the past twenty years. My interest in writing for the flute goes back to student days and I have always been attracted to its possibilities of both extreme lyricism and extreme agility and virtuosity. These are qualities, which feature, in about equal measure, throughout my entire compositional output. The compositions for guitar have been more recent, starting with Guitar Sonata No. 1 written in 1989, followed by Guitar Sonata No. 2 in 1998. In these works and in the title piece In Winter Light I have attempted to capture something of the instrument’s unique, evocative and magical sound world.The title piece In Winter Light, brings flute—this time alto flute—and guitar together and in a way is a culmination of these two separate compositional journeys. The two instruments, with their dark sonorities but otherwise contrasting character, provide a wonderful compliment to each other. Born in Templeglantine, County Limerick, Ireland, in 1951, John Buckley studied flute and composition at the Royal Irish Academy of Music. His subsequent studies were in Cardiff with the Welsh composer Alun Hoddinott and with John Cage. He has written a diverse range of work, from solo instruments to full orchestra. His music has been performed and broadcast in more than forty countries worldwide. He is also active as a lecturer on composition, music appreciation and music in education and is on the staff of St. Patrick’s College, Drumcondra, Dublin. Internationally acclaimed guitar virtuoso John Feeley was born in Ballinasloe, County Galway, and graduated in music from Trinity College, Dublin. He went to the United States to continue his education, studying with a number of guitarists including Oscar Ghiglia, Angel Romero and David Russel. After completing a masters degree at Queens College of the City University, New York, he taught at Memphis State University for a number of years. He returned to Ireland to take the post of Professor in Guitar at the Conservatory of Music, Dublin Institute of Technology. Guitar Sonata No. 2 15'18"
4 Allegro energico e brilliante 3'13"
Fantasia No. 1 for Alto Flute 2'50"
6 Fantasia No. 2 for Alto Flute 4'40"
Guitar Sonata No. 1 13'51"
9 Allegro con spirito 2'41"
Three Pieces for Solo Flute 9'25"
Lullaby for Deidre (Solo Guitar) 2'42"
In Winter Light (Alto Flute and Guitar) 13'58"